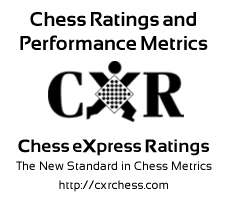 12,794 Smart chess players' stats live here! Tournaments Click here to see a list of our tournaments and events. For recent Quad results, click here. Number of players displayed: 1. Player IDs of players imported to this affiliate are shown with a trailing plus sign + . Status: 1st letter is R=Rated, P=Provisional..
2nd letter is A=Adult, S=Scholastic. You can sort the players by their values in any column simply by clicking on the blue column heading. For example, click on "Official" to see the selected players displayed in order by Official Rating. Further, if you sort the players by one column, and then sort by another column, the players are sorted by the old column values within the new column values.